Dowager’s hump is a lump that can form at the base of the neck, and it is particularly common among seniors. Though this sort of hump is not technically painful, it tends to push the neck forward and contribute to shoulder, neck, and upper back discomfort. Since it can be difficult to treat this condition, it is best to take steps to prevent a dowager’s hump from developing. Here are a few ways your senior loved one can reduce his or her chances of getting a severe dowager’s hump in old age. 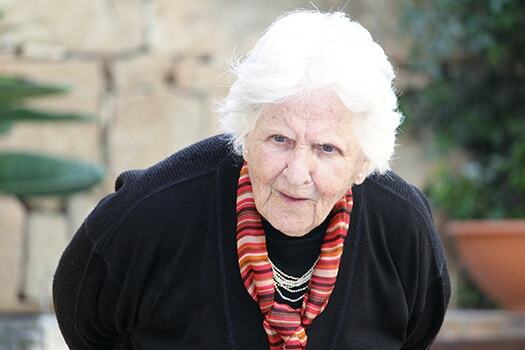 A dowager’s hump can be caused by osteoporosis because the weakened and thinning bones have difficulty properly supporting the head. This can lead to bad posture and spine damage that makes a dowager’s hump much more severe. One of the easiest ways to prevent osteoporosis is by eating adequate amounts of calcium and vitamin D to keep bones healthy. Another way to help your senior loved one manage osteoporosis and other health conditions is to hire a professional caregiver who can assist with daily tasks. Seniors can face a variety of age-related challenges. Though some families choose to take on the caregiving duties, there may come a time when they need a trusted Rhode Island home care provider. Families sometimes need respite from their duties so they can focus on their other responsibilities, and some seniors need around-the-clock assistance that their families are not able to provide. Home Care Assistance is here to help. Constantly pushing the neck forward and downward is a form of poor posture that can lead to a dowager’s hump. Bad posture causes a dowager’s hump because it puts excessive stress along the vertebrae at the base of the neck. When possible, your loved one should try to keep his or her shoulders back and head lifted to an even level at all times. If your loved one wants to look at a book or phone, he or she should lift it slightly instead of hunching forward to view it. Poor posture is often caused by excessively tight muscles that pull the body into misalignment. Regularly stretching can increase flexibility and keep the neck and shoulders aligned in proper posture. Gentle stretching at home can be helpful. Your loved one can also talk to the doctor to get recommendations for stretches or yoga postures that alleviate tension in the neck and increase spinal flexibility. If your elderly loved one lives alone at home and you are concerned about his or her risk of dowager’s hump, consider hiring a caregiver. One of the most challenging tasks of helping an elderly relative age in place safely and comfortably is researching home care agencies. Rhode Island families can turn to Home Care Assistance for reliable, high-quality in-home care for aging adults. We offer 24-hour live-in care for seniors who require extensive assistance, and we also offer respite care for family caregivers who need a break from their caregiving duties. Exercise builds muscles that enhance posture and keep the neck from being pushed forward. However, neck and shoulder exercises are not the only way to protect against dowager’s hump. Having a strong core with well-maintained abdominal muscles and back muscles can keep the entire spine in alignment. Performing weight bearing exercises can also reduce osteoporosis. In some cases, dowager’s hump has been linked to previous injuries and strains in the neck. Therefore, your loved one should avoid risky situations that could end up damaging his or her neck whenever possible. Your loved one should be careful to lift with the legs instead of the back and neck when carrying heavy objects. He or she should wear protective gear or take steps to avoid stressful positions whenever playing sports that may harm the neck. Taking any or all of these approaches can make daily living more comfortable for your loved one. If your aging loved one needs occasional help with bathing, grooming, cooking, or other basic household tasks, or if you need time to attend to important personal matters, reach out to Home Care Assistance, a leading provider of live-in and respite care. Rhode Island seniors can maintain their independence while living at home with the help of our reliable respite caregivers. Call us at (401) 284-0979 to create a customized care plan for your elderly loved one. What Are the Most Serious Consequences of a Fall?